Part of series on the Aquarian Sadhana Mantras, in this article Puranjot Kaur reflects on the shabad Rakhay Rakhanahar. Part of series on the Aquarian Sadhana Mantras, in this article Puranjot Kaur reflects on the Aquarian Mantra - Sat Siri, Siri Akal. Part of series on the Aquarian Sadhana Mantras, in this article Puranjot Kaur reflects on the "root mantra" - The Mul Mantra. Part of series on the Aquarian Sadhana Mantras, in this article Puranjot Kaur reflects on the creative energy of Wah Yantee. 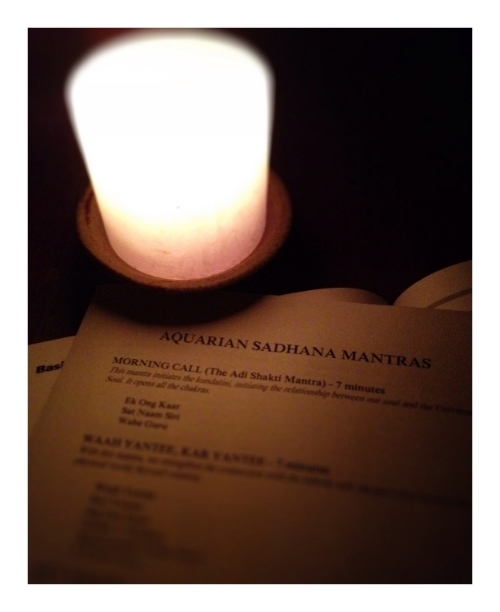 Part of series on the Aquarian Sadhana Mantras, in this article Puranjot Kaur enlightens us about Morning Call. Wondering how you might "pull off" white yoga pants? Read this! What's with the White Clothes? New to Kundalini and wondering why everyone is wearing white? Read this! "Before I knew it the ambrosial hours turned into ambrosial-ish hours, and then ambrosial-ish turned into ambrosial-...later.. And then, 2 hours of meditation somehow transformed into 5 minutes of chanting Waheguru in my head - yes, while still cuddled up under the covers in bed." Just signed up for your first White Tantric course? Here's what you need to know! From the yogic perspective, 7 reasons to use a wooden brush or comb. "So you walk into a Kundalini Yoga class not knowing what to expect, and you see a lot of people with their heads covered… hats, scarves, bandanas…"